Shallow seamounts (rising at depth lesser than 500m below the sea surface) are known to generate instabilities in the flow field which may potentially increase biological productivity. Upwelling, internal waves, retention cells are among the processes involved. In the SWIO, three sites have been selected to develop ecosystem research based on field trips organized and achieved in the framework of ICEMASA, involving multidisciplinary, multi-institute and international research teams. These sea operations are part of the WIOURI (West Indian Ocean Upwelling Research Initiative) of IIOE-2, managed by Pr Mike Roberts (NOC/NMU). The three seamounts investigated are La Pérouse seamount (90 NM north-west of La Réunion Island), an unnamed seamount part of the Madagascar Ridge at 150 NM South of Madagascar (the MAD-Ridge project) and the Walters Shoals (an isolated very shallow seamount at the south of the Madagascar Ridge), all present indices of enhanced biological production at the top predator level (fisheries, seabirds and marine mammals). They are located in different ecological provinces with contrasted environmental settings (the oligotrophic sub- tropical gyre for La Pérouse, the corridor of westward migrating mesoscale eddies for MAD-Ridge, and the subtropical / temperate transition zone for Walters Shoal. For the three cruises, we managed to collect observations on physical oceanography (CTD, ADCP), marine chemistry and biogeochemistry (nutrients, oxygen, chlorophyll a and pigments), biological oceanography (phyto- and zoo-plankton, micronekton, bio-acoustics), seabirds and marine mammals, in as similar as possible conditions and strategy. Trophic markers (stable isotopes) were also sampled during the three cruises. Each cruise got specific component however (pelagic and demersal fishery for La Pérouse, high resolution physical measurements for MAD-Ridge, a benthic component for Waters Shoal) but they were mostly conducted with the objective of supporting comparative analysis. La Pérouse cruise took place on 15-29 September 2016 onboard the IRD R/V ANTEA, mostly involving French participants (10); MAD-Ridge was from 9 November to 14 December 2016, again onboard the R/V ANTEA, involving participants (18) from France (including La Réunion), South-Africa (DEA, NMU and BCRE), Madagascar and Mauritius; and Walters Shoal was from 22 April to 18 May onboard the French R/V Marion Dufresne, with a “pelagic” component of 9 scientists from France, South Africa and Madagascar. The latest cruise was also supported by the FFEM (Fonds Français pour l’Environnement Mondial) and IUCN (International Union for Nature Conservation), and the “benthic component was driven by the French Museum National d’Histoire Naturelle (MNHN). Post graduate students (from Mauritius and Madagascar) were part of the field trips and are closely involved in the scientific analysis of the data collected at sea. Preliminary results have been presented in July 2017 (SAMSS conference, Port Elizabeth), August 2017 (IAPSO Conference, Cape Town) and November 2017 (WIOMSA Symposium, Dar es Salaam, Tanzania). 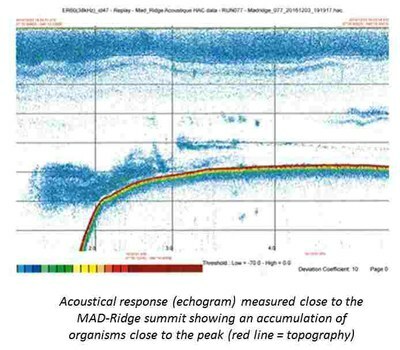 Most advanced analyses are on the descriptive oceanography (hydrology and currents, with the strong impact of mesoscale eddies on properties distribution during the MAD-Ridge cruise, for instance), on acoustics (during both La Pérouse and MAD-Ridge, showing intensified acoustical responses close to the topography, for instance) and on zooplankton (with preliminary assessment of zooplankton biovolume being higher at La Pérouse compared to the slopes of the MAD-Ridge seamount, and finally Walters Shoals). MSc and PhD theses are presently conducted started, on these cruises results. Collaborations : J-F Ternon (IRD), F. Marsac (IRD), J. Huggett (DEA), M. Noyon (NMU/BCRE), M. Roberts (NMU), E. Rocke (UCT), Y. Chérel (CNRS), F. Ménard (IRD), H. Demarcq (IRD), D. Thibault (IRD), S. Herbette (UBO), S. Jaquemet (Univ. Réunion), P. Vianello (PostDoc), S. Harris (PostDoc), P. Annasawmy (PhD candidate), F. Dilmahamod (PhD candidate), Z. Rasoloarijao (MSc student).